The chief superintendent who headed Britain’s police response to the Hillsborough disaster issued a call for extra police and dogs but no ambulances as football fans were being crushed to death at the stadium, inquests have heard. David Duckenfield, a 70-year-old retired police chief, faced cross-examination for the third consecutive day on Friday, as lawyers probed him on his handling of the tragedy. As he gave evidence to lawyers representing the victims' families, Duckenfield denied he perceived unfolding chaos at the match as hooliganism rather than a threat to fans’ safety. Previously, the retired police chief admitted he had made a number of “mistakes” on the day of the tragedy. He said he had lied in the aftermath of the deaths and offered his unreserved apology to the families of the deceased for doing so. During Friday’s inquest hearing, Duckenfield was questioned yet again on his actions prior to, during and in the aftermath of the disaster. As the kick-off drew closer, police at the stadium became increasingly overwhelmed by football fans gathered at the turnstiles.In response to the situation, Duckenfield demanded the gates be opened. In the minutes that followed, as many as 2,000 football fans flooded in through the stadium’s Gate C. Much of the crowd headed towards the tunnel nearest to them – a passage Duckenfield had neglected to ensure was closed.The tunnel led to pens on the Leppings Lane terrace that had reached full capacity. This oversight amounted to “a blunder of the first magnitude,” the Guardian reported the inquest jury as hearing. Ninety-six Liverpool fans perished in the crush that followed, as the much anticipated FA Cup semi-final game against Nottingham Forest began. 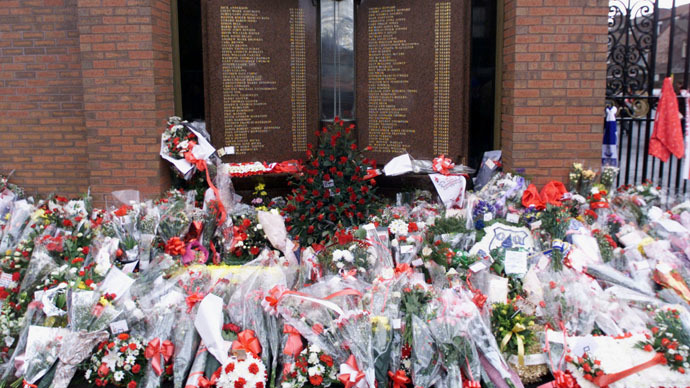 The Hillsborough Justice Campaign maintains the deaths were “totally unnecessary.” The group has long advocated for the truth of the tragedy to be revealed. Official transcripts of audio recordings documenting the police response to the crisis reveal an officer ranked beneath Duckenfield ordering extra police dogs. The retired chief superintendent responded that he had “no idea.” He said he had tried to carve out a secure space to aid the rescue of people. “And you're calling for increased police manpower. There is no declaration of a major incident,” Menon said. Duckenfield said he initially interpreted events on the terrace as disorder amongst the crowd. He said he failed to realize a medical emergency was developing until 3.04 pm. Menon asked whether Duckenfield had noticed anyone in distress. “Twenty-six years ago I saw many, if not all of, these scenes. Recollecting them in detail is another matter now,” Duckenfield said. “As soon as I realized this disaster was happening, I switched into overdrive, and I remember issuing a list of instructions very quickly at the top of my voice and I remember someone saying ‘for goodness sake boss, shut up - we can't implement the first instruction." Hillsborough: Duckenfield met minister of sport Moynihan night of disaster, Margaret Thatcher the following day. Says can't remember either. Speaking to RT, Kenny Derbyshire, chairman for the Hillsborough Justice Campaign, said he found Duckenfield’s response to the crisis difficult to understand. He said Duckenfield had, perhaps, demonstrated a lack of experience as the catastrophe unfolded. Asked whether he thought the families of the deceased victims deserve some form of compensation, Derbyshire declined to specify. He said, however, that they were entitled to the truth and for those responsible for the disaster to be held accountable. Derbyshire was in the Hillsborough stadium during the disaster, but escaped without injury.